Settlement Keywords expands on the current Settlement Menu system offering mod authors even more categories to use for their mods. Craftable Greebles Only if you're using the 1.5 SKE version. Sanctuary Little Village -OPTIONAL, not needed. 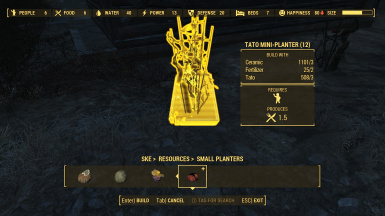 Tenpines Bluff Little Village Not needed, optional. You have my permission to translate this into other languages but I ask the translation be hosted on the Nexus. I am happy to provide a link to your translation. With the exception of SKE translations, SKE files modified or otherwise especially SettlementKeywords.esm may not be uploaded to the Nexus or any other site including Bethesda.net. Thanks to all who have contributed to the discussion on how to expand the menu options. These contributors include, Ethreon, Gruffydd, VIitS, Gambit77, Wolftech, RustyXXL. I could not have made this without their feedback. Other thanks goes to eldiabs, jsxaraan for reminding me that not every system works for everyone. I value their input and will try to make future versions utilize some of their ideas for the menu structure as well. Uploaded new file because of Nexus 0kb filesize issue. New version number because Nexus will have issues if the version number is the same. Added SKE Holotape. If upgrading you can craft one at a Chem Station. Rearanged vehicles and furniture menu. Menus start with type first, then post or pre war items. Updated Homemker patch for v1.41. Menus slightly reworked. See sticky post for more details. Updated FOMOD NMM installer. NMM has a bug that needs reporting. Completely restructured the Settlement Menu see the Readme Section for details. Settlement Keywords Expanded is a continuation of Stuyk's framework. 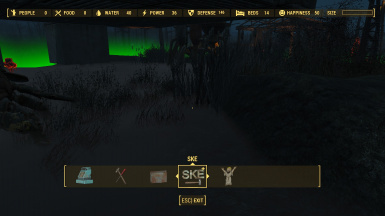 SKE is a mod authors resource and provides an alternative to adding items to the Bethesda vanilla menus. With SKE mod authors have more choices for their settlement items. 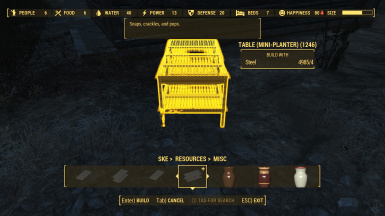 More choices means less clutter in settlement menus. The file provided, SettlementKeywords.esm, will work with some SK mods. This mod doesn't alter any of the vanilla menus so it will not conflict with any DLC. Missing vanilla menus are only caused by outdated menu patches or outdated SK mods that have not been updated. A list of mods that should not be used with SKE is provided below. Requires Fallout 4 patch 1.6.3 or greater! As of SKE 1.46 I now offer a scripted menu option. Chose either the version that alters the settlement record directly as with previous versions of SKE, or choose the version that adds the SKE menu with a Papyrus script. If you choose the scripted menu option and you plan to uninstall SKE, remember to craft and use the uninstall chem to remove the scripted menu properties from your save game. 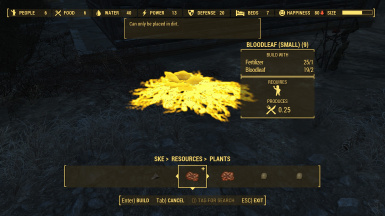 As of SKE 1.51 the scripted menu option now offers Menu Restore chems. They will add a single SKE menu like previous version offered, and a multi menu option similar to what DOOMBASED offered with SKI. SKE is compatible with all DLC including Nuka-World. Styuk made a Google Document on how to use this in your mods. Like Stuyk, I also recommend that you do not create new Form Lists, FormIDs, Keywords, or alter the menus. SKE may be required as a resource for the mod you are using. Check the authors description page to see if a patch is needed or available. 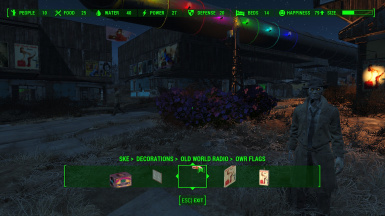 If no patch is available you will need to create one with FO4Edit. To see how to create patches that resolve and override conflicts you can download the xEdit (meaning all versions) Training Manual here. 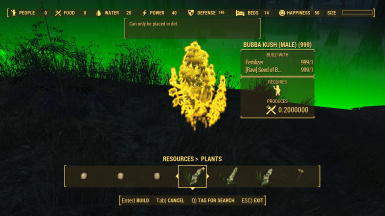 It says rough draft and it was initially intended for FO3/FNV however, the FO4Edit UI is the same so you can still use it for creating patches. How to resolve conflicts is discussed in Section 4. SKE doesn't require any DLC content. SKE is a totally independent mod and does not require users to install SK by Stuyk. SKE patches require the original mod to be installed. Download and install the original mod and overwrite the old ESM or ESP file with the one I provide. The original mod will provide all the scripts, meshes, textures and anything else the mod needs. I only provide the replacement plugin files. If you chose the SKE version that adds the SKE menu with a script be sure to craft and use the chem prior to uninstalling manually or with NMM. The other SKE version that doesn't use the papyrus script to add its menu doesn't require a chem. Below is a list of mods I provide a patch for. While the listed mods are compatible with SKE and don't alter any vanilla menus, the mods alter other vanilla records. This may effect the resources required to build the item and may also cause the settlement item to appear in the SKE menu instead of the vanilla menu. 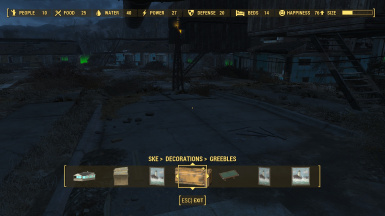 While these mods do not require a Patch to use SKE they may place items in the vanilla menus. Improper installation or uninstallation will result in permanent menu loss and the changes will be reflected in your save game. Follow all authors instructions as I cannot help you if a script has damaged your Settlement menu. 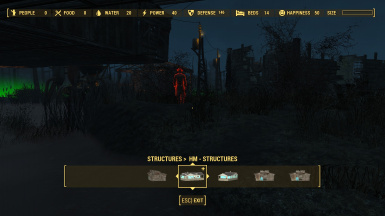 The following mods alter settlement menus directly and may need menu patches. The listed mods when used together will cause conflicts between themselves. NOTE: Authors can release SKE Patches with FO4Edit. NOTE: Patches can be made to use this framework with FO4Edit. 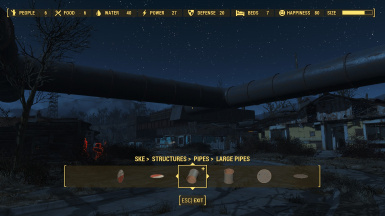 I provide working fixes for the Settlement menus and some popular mods. 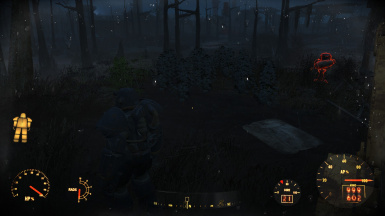 However, I have not provided fixes for every settlement mod on the nexus. 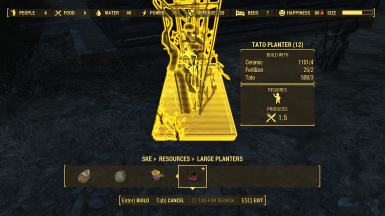 Some mods like Business Settlements have provided SK patches that could still work depending on what the author changed. For the most part though, if I have offered a fix in the download section then you shouldn't need compatibility patches and they may undue what I fixed. Below is a list of mods that you should remove from your load order. Homemaker patches are no longer provided because of Homemaker 1.50 or higher. new mod file. I'll link it via Description. Thanks to Stuyk for making this available to be updated by others. Thanks to Ethreon for new SKE icon. It is greatly appreciated. VIitS, Gambit77, Wolftech, and RustyXXL. I could not have made this without their feedback. Other thanks goes to eldiabs, and jsxaraan for reminding me that not every system works for everyone. I value their input and will try to utilize some of their ideas for future versions.